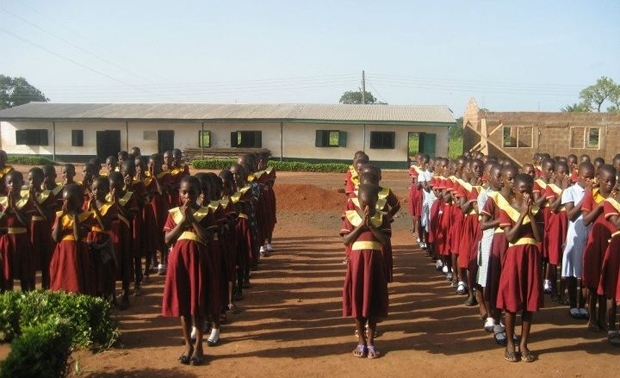 Let Us Shine’s core project is the Let Us Shine Girls’ Academy, based in Kpandai in the Northern Region of Ghana. The project started in 2007 with a girls’ primary school which aimed to improve education levels for local girls who previously had poor access to schooling. Due to the rural location of the girls’ home villages, we adapted the school into a boarding facility, expanding the site to include more classrooms. The Let Us Shine Girls Academy is now a full boarding school complex which provides for girls from primary 1 stage right through to senior high within a safe, healthy and supporting learning environment. The site has a full primary school, a junior secondary high school and a senior secondary high school, with a total of 15 classrooms, a science lab, a study hall, a library and an IT centre. What goes on at the Girls’ Academy? We have 26 teachers at the Girls’ Academy who teach a different academic syllabus for each age group. The curriculum each student follows is supplemented by programmes which focus on health education and developing personal and social skills to prepare them for the next stage of their career. The Academy provides good quality accommodation to its boarders and our students follow a healthy and balanced diet through the three meals a day provided. Their healthcare is covered to a limited extent by national health insurance and is supplemented by our full vaccination program. The students all come from local villages, and many return home to visit family and relatives at weekends and during academic holidays. Parental engagement is a significant objective of this core project, and we ensure we personally meet and explain our working philosophies to all pupils, parents and families. All text books and teachers’ salaries. Read about how you can sponsor one of the girls and other ways you can help them shine.